The younger generation may think that all of today’s technology is reserved only for their use, but that’s simply not the truth. Many areas of this digital age can greatly benefit senior citizens, and here are just five ways that older folks can use technology to enhance their lives. 1. Cellphones: Today’s seniors aren’t typically sitting home in rocking chairs or baking cookies. Active senior citizens may enjoy travel or fast-paced social lives, and this makes a cell phone the perfect way to keep in touch wherever you roam. While many phones are difficult to use and feature tiny buttons, there are some very easy to use cell phones for seniors that utilize large, easy-to-see buttons that are just perfect for the older population. 2. Advanced Recliners Nothing beats a hot massage at the end of the day. New technologies in recliners are ready for the 21st century. Today some power lift recliners heat, massage, and much more. They can even help you get up after your snooze. 3. Medical Alert Systems: If you’re a senior citizen who has been afflicted with health issues, then you can still live alone in your own home without fear. Many companies offer medical alert systems that allow you to wear a pendant-style device that can summon help with the press of a button. Others are programmed to call for assistance if a fall is detected, and there are even companies that track your movements through GPS so that you can be helped even when you’re away from home. 4. 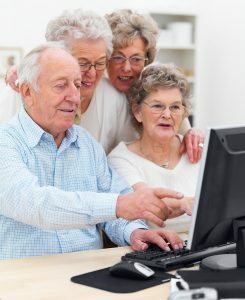 Computers: Internet companies are keeping senior citizens connected throughout the world. It’s a wonderful method of making new friends, joining groups with those who share your favorite hobbies and keeping up with local and worldwide news. Seniors may also keep up with their extended family and see related pictures through social media, shop online, research medical concerns and arrange for local services online. 5. Electronic Readers: Aging eyes can lose the ability to read normal-size print, and this is a great loss to those who have loved to read their entire lives. With the help of various tablets and e-readers, senior citizens can download books, newspapers and magazines, which can be read at any size that the individual requires. These e-readers can also change the brightness to suit your visual needs.